Star Trek: What are cultural faux pas when working at Starfleet? What Are Cultural Faux Pas When Working at Star Trek’s Starfleet? Marina Sirtis as Counselor Deanna Troi in Star Trek: The Next Generation. Having a relationship with a holographic image of a real person. If that cute ship’s counselor won’t give you the time of day, why not just recreate her in the holodeck? It must be tempting, but it can go horribly wrong if the objects of your “recreational” programs find out what you’ve been up to. Who does it: Lt. Barclay in “Holly Pursuits,” Star Trek: The Next Generation; Geordi LaForge in “Booby Trap,” Star Trek: The Next Generation; Quark in “Meridian,” Star Trek: Deep Space Nine; countless other people. The result: “I’m outraged by this! I have been invaded, violated! How dare you use me like this? How far did it go anyway? Was it good for you?” —Dr. Leah Brahms, upon discovering Geordi’s holographic version of her. Being polite to a Zaldan. A successful Starfleet recruit should be able to recognize this unique species by their webbed fingers and know that in their culture they consider courtesy to be a sign of deceit and insincerity. Who does it: Wesley almost makes this mistake in “Coming of Age” in Star Trek: The Next Generation but corrects himself in time to make the appropriate insult. Being dishonest, even to protect oneself or one’s friends. Starfleet officers are expected to tell the truth at all times, even when it is self-incriminating or may harm people they care about. If you are discovered in a lie, you may be forced to stand down or even resign your commission. Who does it: Wesley in “The First Duty,” Data in “Clues,” Simon Tarses in “The Drumhead,” all in Star Trek: The Next Generation. Not wearing the proper uniform. Though some people may get away with it with lenient commanders, all officers are expected to wear their uniforms when on duty. This is probably a good thing, considering the fashion alternatives that seem to be available to people. 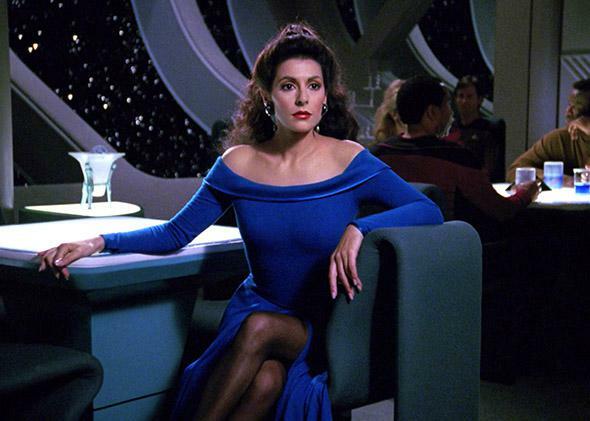 Who does it: Counselor Troi, until ordered to wear a uniform in “Chain of Command” in Star Trek: The Next Generation. Firing on a ship before identifying it. In a combat situation, especially where cloaked ships are involved, it’s all too easy to be reactive and fire on anything that moves. However, caution is advised, as the consequences of accidentally destroying a civilian vessel are quite dire. Who does it: Commander Worf in “Rules of Engagement” in Star Trek: Deep Space Nine. The Prime Directive is supposedly Starfleet’s most important binding principle. It states that Starfleet will not interfere in another culture’s internal affairs, social order, or development, especially in prewarp civilizations. Who does it: Every captain on every series of Star Trek, often multiple times. Star Trek: Voyager: Why hasn’t there been a Star Trek movie based on Enterprise, Deep Space Nine or Voyager? Star Trek: How does warp drive work on Star Trek? Star Trek: The Next Generation: What species in the Star Trek universe has the potential to be the most destructive and why?